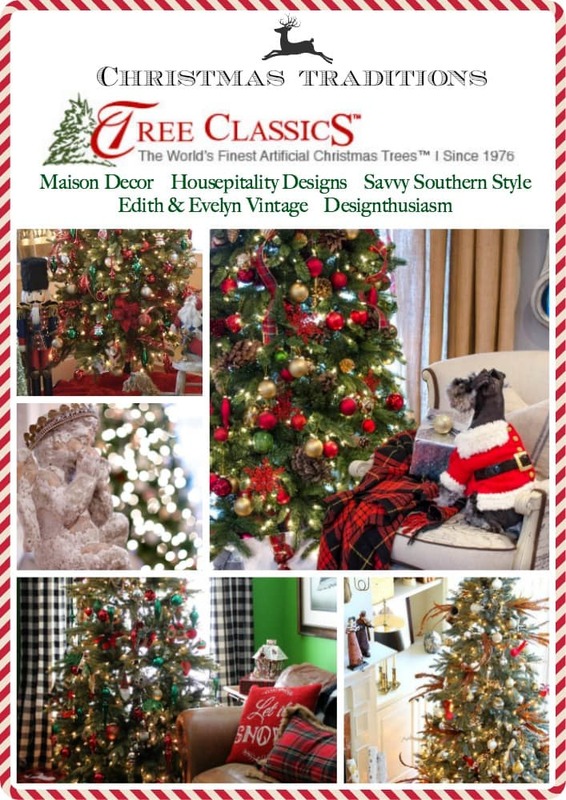 I’m delighted to be joining with a group of bloggers in partnership with Tree Classics, our sponsor who has provided us with trees, ornaments and tree skirts to create trees that express our own visions and pay homage to our traditions. We hope this little tour inspires you to do the same with your own tree. 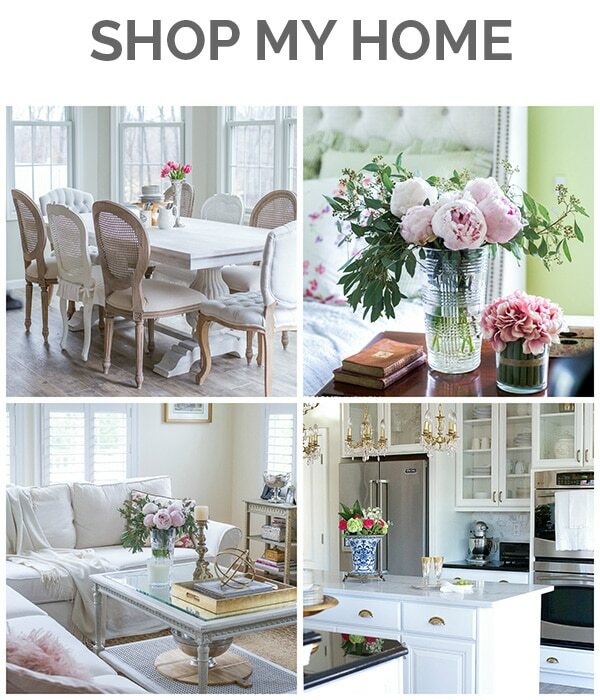 Special thanks to Amy from Maison Decor for organizing the tour, as well. 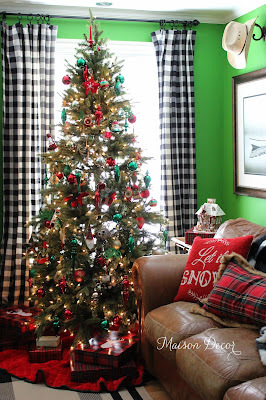 And since I’ve been talking about it long enough, it’s time for the reveal of my tree! I started with a Classic Fraser Fir with clear lights. We have 9′ ceilings so I went with the 7 1/2 foot tree, leaving room at the top for an interesting topper to maybe add in the future. For now I just used a pretty wired bow with lots of holiday sparkle. 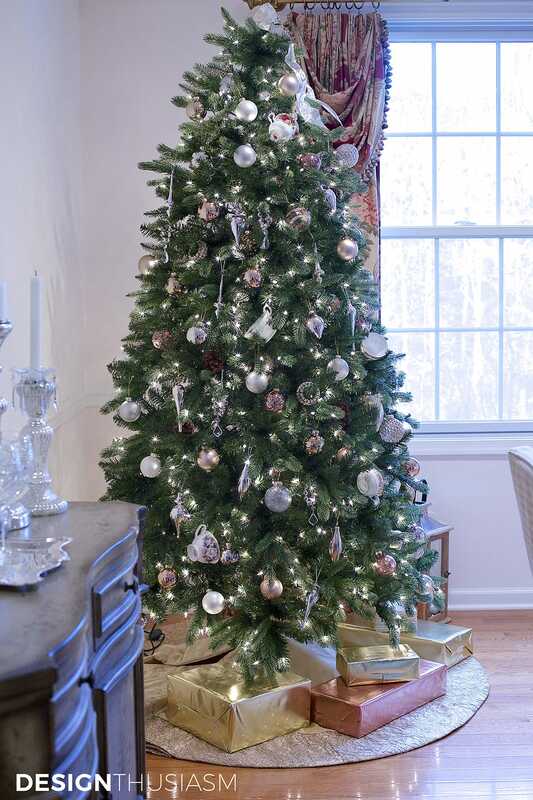 At a quick glance, the tree looks pretty traditional with a base of gold and silver ornaments. But I am a tablescaper and this is my first tree so I wanted to create my own new traditions that reflect my personal style. The first thing I knew that needed to be added to the tree was a representation of my passion for vintage china. I selected my favorite vintage teacups from my collection and went to work, wiring them to the tree. I also chose to place the tree in our dining room so this imagery made conceptual sense. I often use mixed patterned china on my tables and I have plate racks on the wall to showcase an ever-changing display of pieces I’ve added to my collection over time. 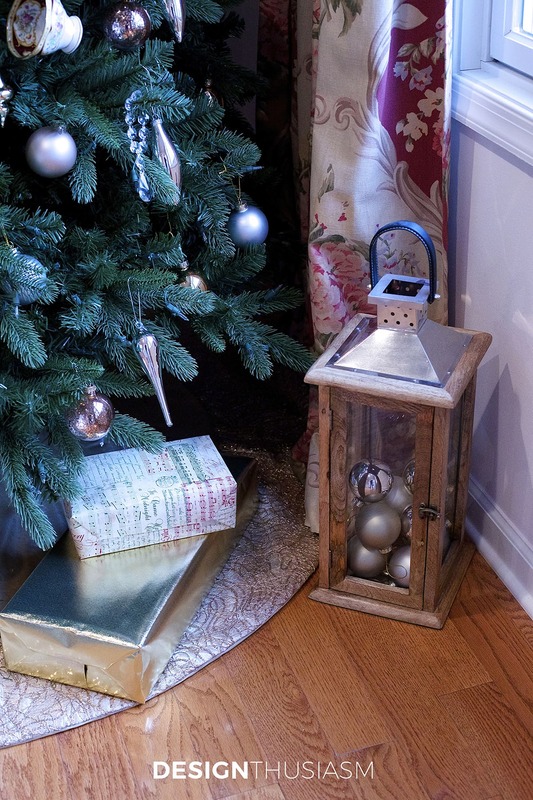 The golden tree skirt is the perfect base as it has a lovely shimmer and works well with my color palette. 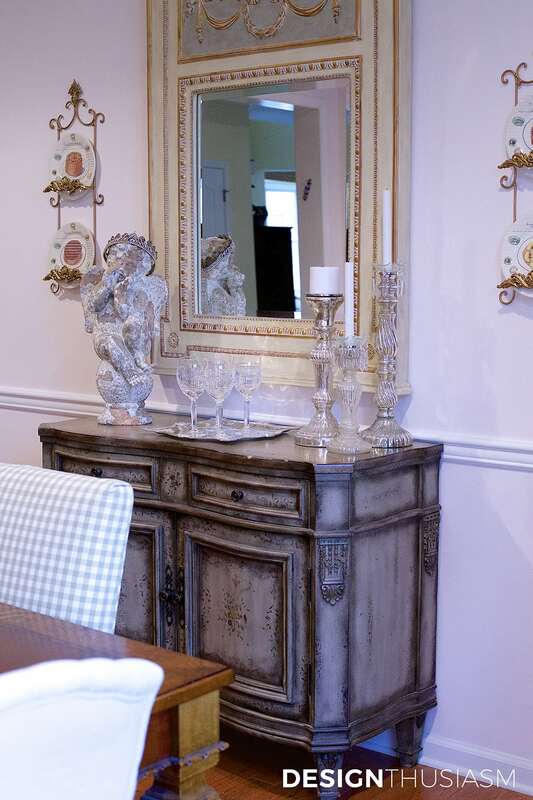 I wanted to stick with roses and pinks, typically found on vintage china, as well as the more neutral gold and silver. Wooden lanterns sit nearby, housing additional ornaments. I also added napkin rings to continue with the tablescaping theme, and above you can see the crystal bracelet rings sitting comfortably on a branch. 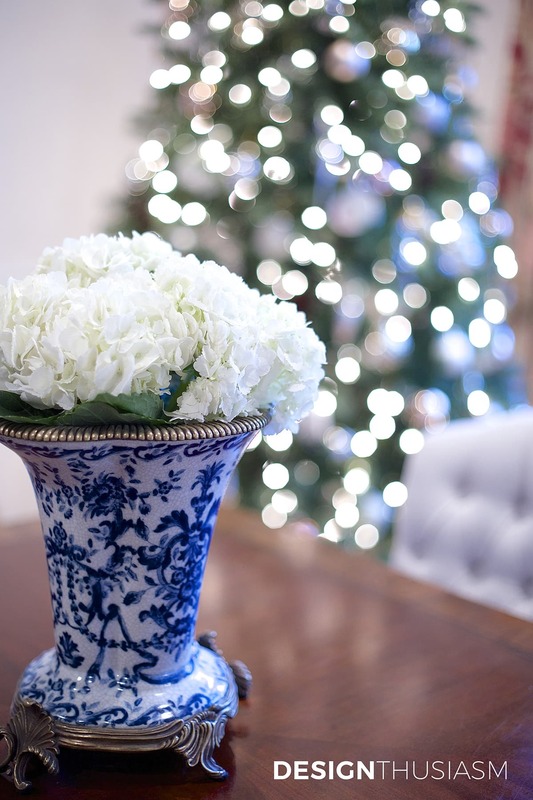 The fresh flowers in the room are simple white hydrangeas to maintain the clean and subtle color feeling. 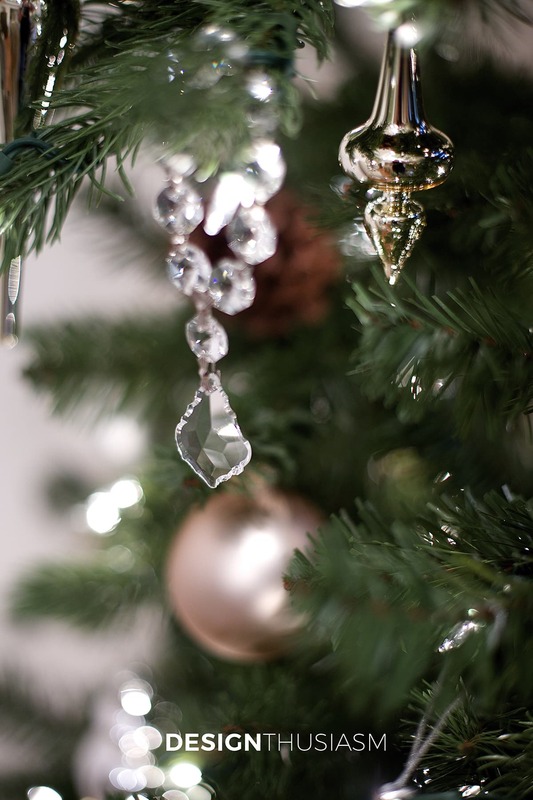 The ornaments from Tree Classics are a plentiful mix of varied gold and silver pieces, in shiny, matte, glittered and transparent, with textured and smooth surfaces alike. 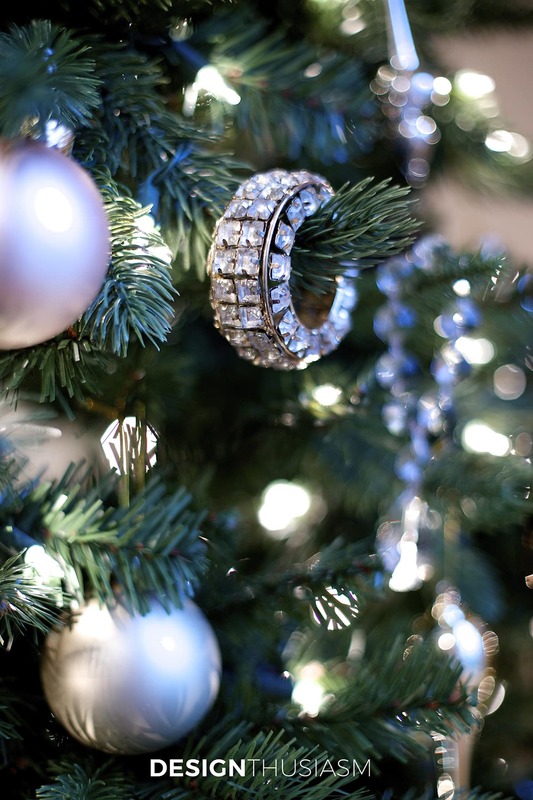 The crystal drops are from another set of my napkin rings, looped casually over the branches. I’ll let you in on a little secret, too. The wrapped gifts underneath my tree are actually the now-empty storage boxes from the ornaments. When I take down my tree, the boxes to re-store everything will be conveniently right nearby. I did add some rose gold ornaments to the mix in keeping with my color palette for this year. 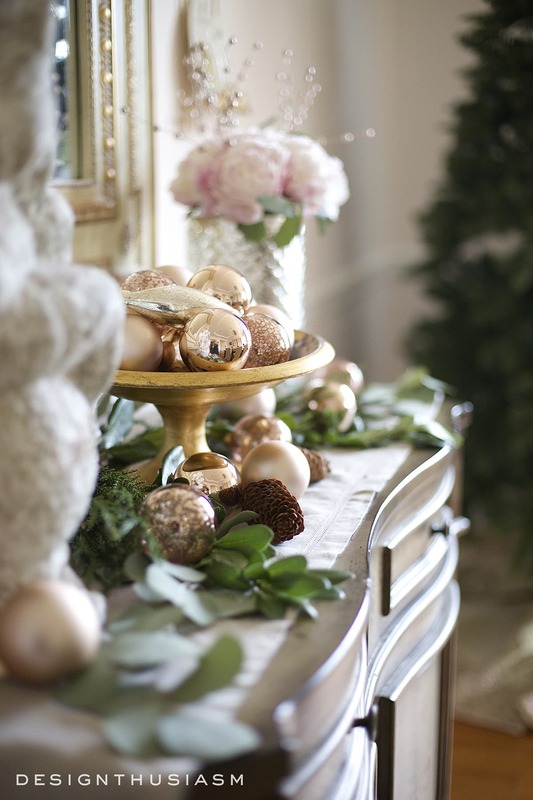 You can get a closer look at how I’ve used them before in my pink and gold Christmas tablescape and my rose gold sideboard vignette. To add interest in shape, I included gold and silver finials, which also can be found at Tree Classics. The lushness of the tree can even be appreciated in natural daylight with the lights off. I tucked in some pine cones for their wintery feel and they can best be seen this way. So that’s my first go at decorating a Christmas tree! If you’re not a frequent reader and you’re wondering why this is my first tree, it’s that Christmas is actually not part of my religious tradition (we celebrate Hanukkah), but I’ve embraced this delightful decorating challenge with gusto because I enjoy inspiring others to celebrate their own traditions in style. 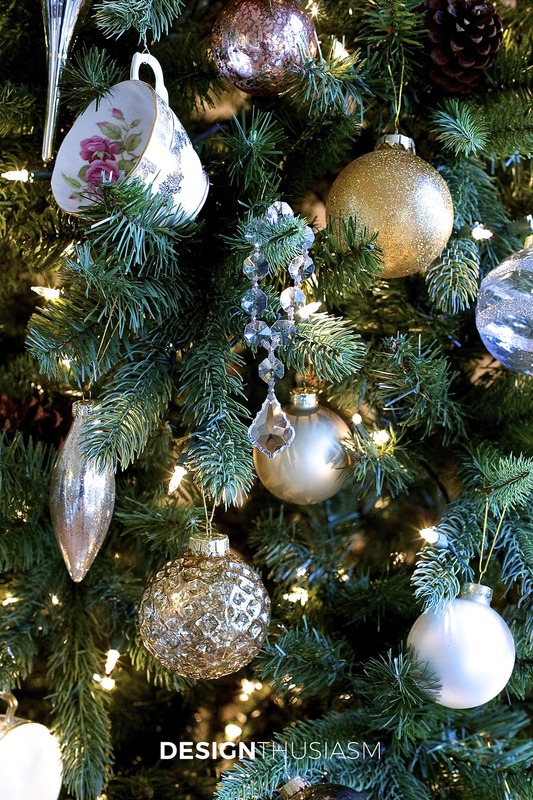 Please take some time to visit the other Christmas tree tours linked below! And have a wonderful holiday season, however you celebrate!! Love it! 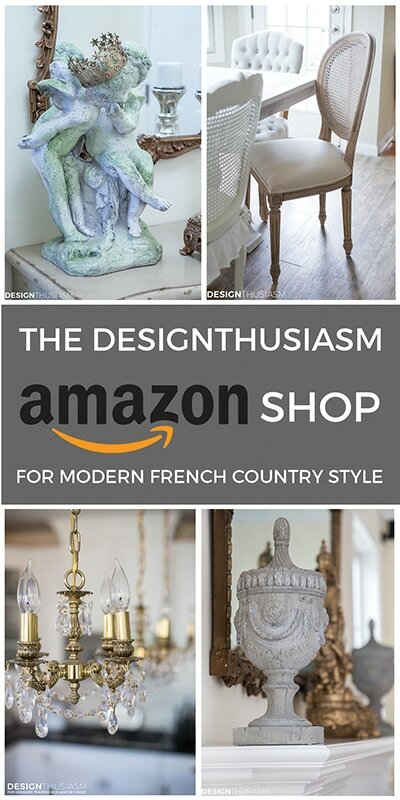 Has me thinking about doing a small tabletop tree using my demitasse/espresso collection. 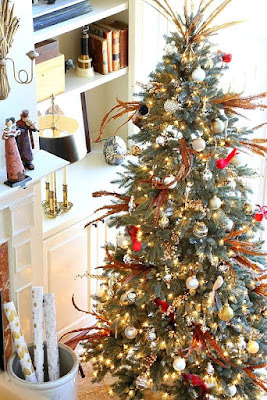 Bravo Lory for the very first tree that you have decorated and what better to start with a gorgeous tree from Tree Classics. 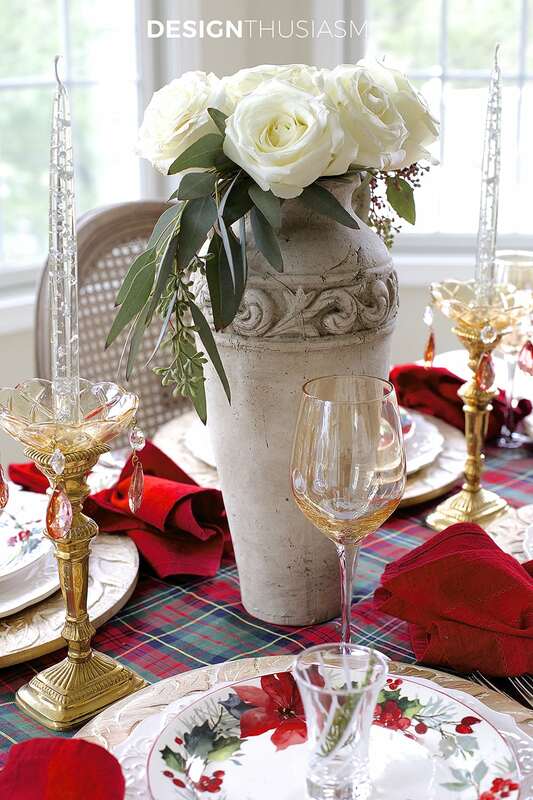 I love that you added your own touch by adding the vintage tea cups as you love to set a most beautiful table. 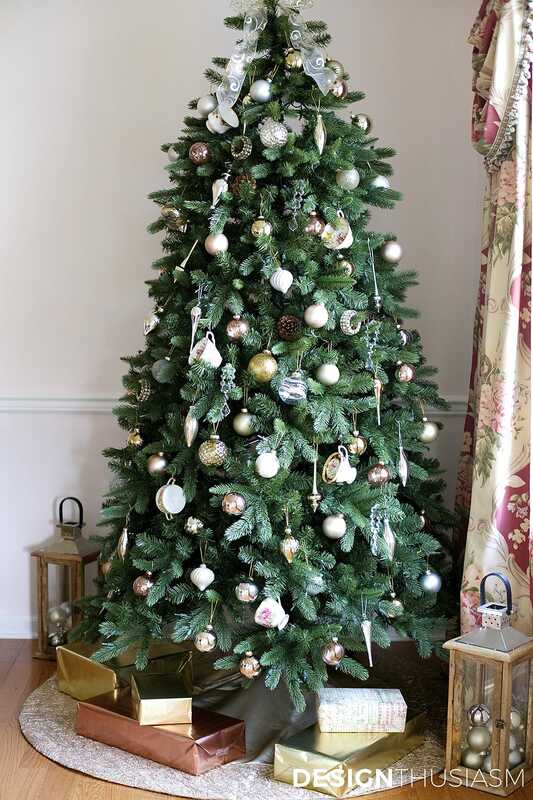 An exquisitely decorated tree to enhance the decor of your beautiful dining room! Have a most wonderful Holiday Lory! Thank you so much, Shirley! It seems the natural way for me to go… 😉 I’m really enjoying being on the tour with such a wonderful group! I love it, Lory! The addition of the vintage cups is such a unique idea. Love the blingy napkin rings, too. I say you did quite well for your first tree. Thanks so much, Kim! As much as I love vintage, I also love my bling… lol. I really had fun with this one and now I’ll want more trees for next year! 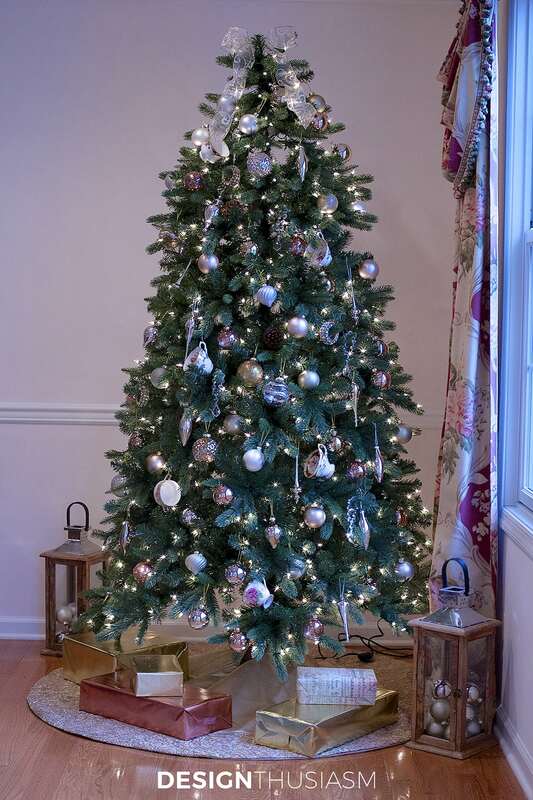 You did such a great job with your tree! I love the teacups. Well done! Lory! How enchanting!! 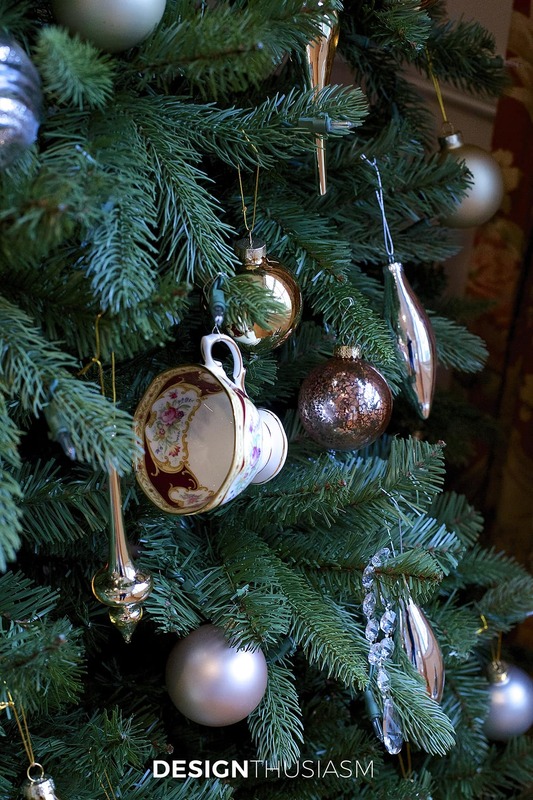 I love the dainty tea cups used for ornaments mixed in with the metallics. 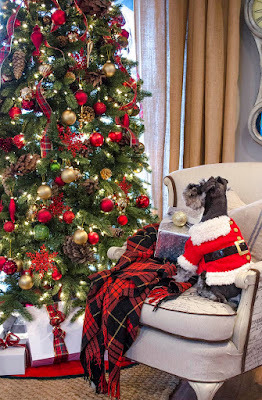 Its lovely and I think wonderful that you are adding a tree for your holiday decor. 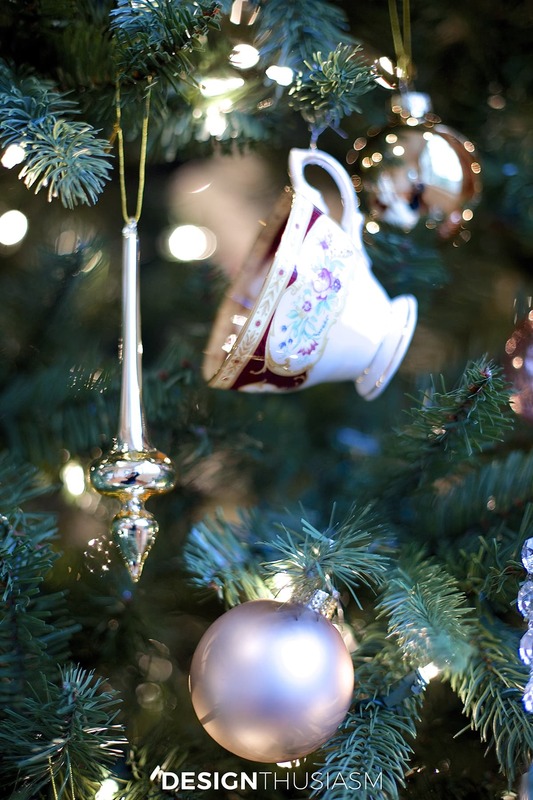 Lory, I am enamored with your vintage teacups on your tree! They are a perfect reflection of your style! Im so happy to be on this tour with all of you beautiful ladies! Well done, Lory! I love the teacups and recognized your napkin rings immediately. How very clever of you! I’m always impressed with your unique view. I was raised Catholic, but like to add a little Hanukkah corner somewhere. This year it’s a set of nine mercury glass votives on a slender “silver” tray I found earlier this year at Pottery Barn. I bumped the center votive with 3 stacked quarters and have an old dreidel ornament next to it. I love the rich traditions of our Judeo-Christian history. 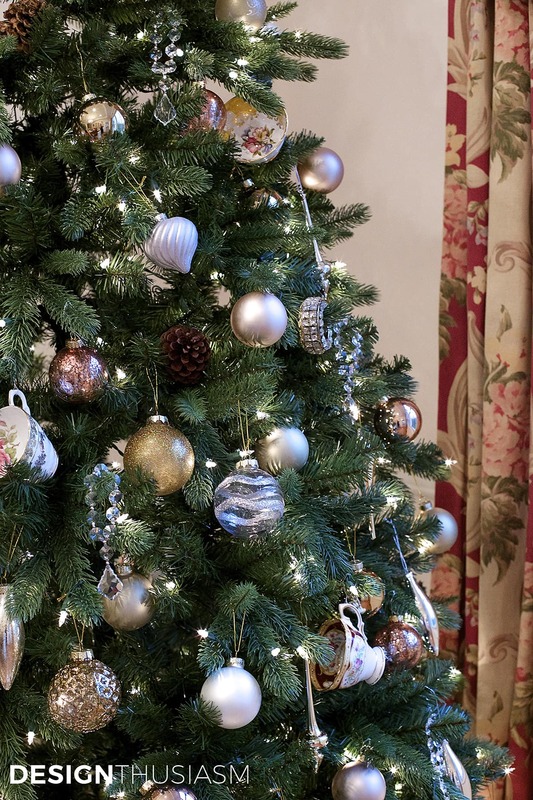 Your tree did not disappoint…I knew it would be fabulous! 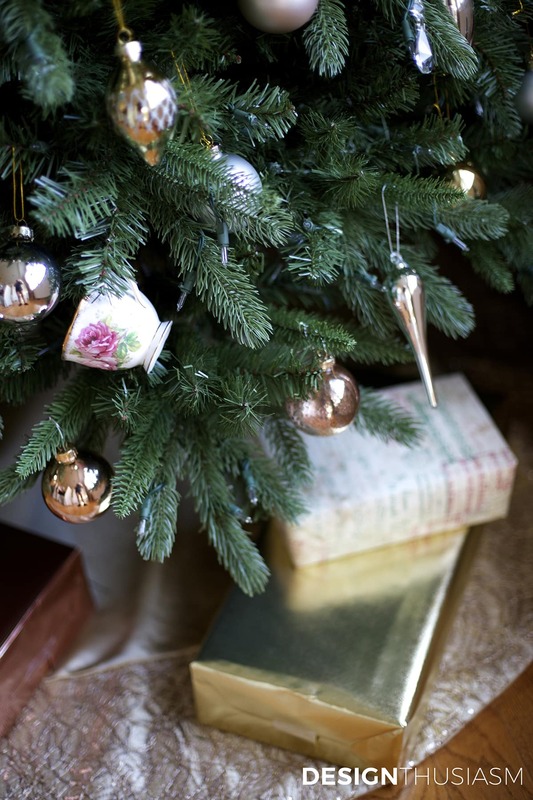 With the tea cups and other table ware in addition to conventional ornaments, you made the tree your own. Love the varied textures of the ornaments. Great idea for keeping the storage boxes close by. 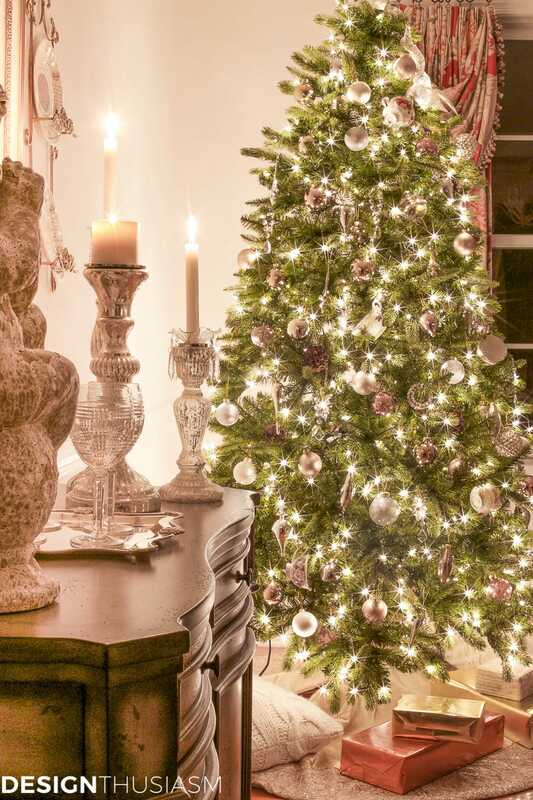 A beautiful tree, love how you used the teacups and napkin rings. Extraordinary use of items, really unique and I LOVE it!! 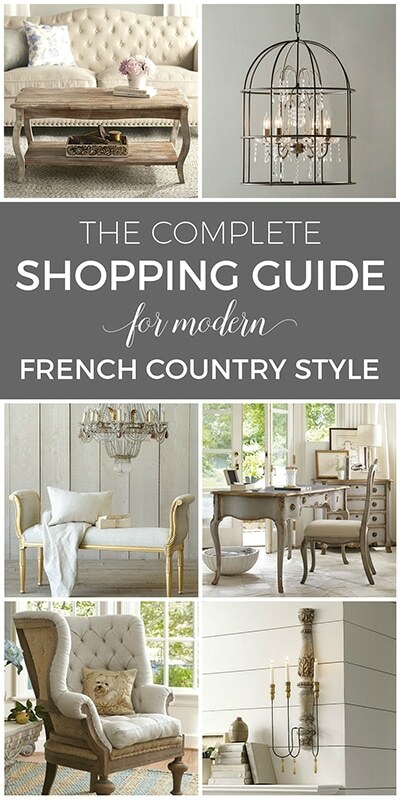 Beautifully done, elegant and classic. Wow, just a great big wow at the creative talent you have! So cute using teacups on a tree Lory! Always so exquisite. What a creative and gorgeous tree! I love the vintage china tea cups! Genius! It’s beautiful and what a great idea to use your china cups!! I would be afraid of them falling and breaking, so I’m not sure I am going to do that, but how I do love the look!!! That is so YOU Lory!!! Bravo. 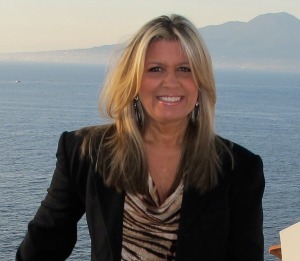 Lory, I’m an agnostic former Catholic…my loving and wonderful husband is a secular Jew. Nevertheless, we always celebrate Hannukah and Christmas. We always prefer when the two holidays occur about the same time as they do this year. I love your first X-Mas tree…lovely and imaginative. 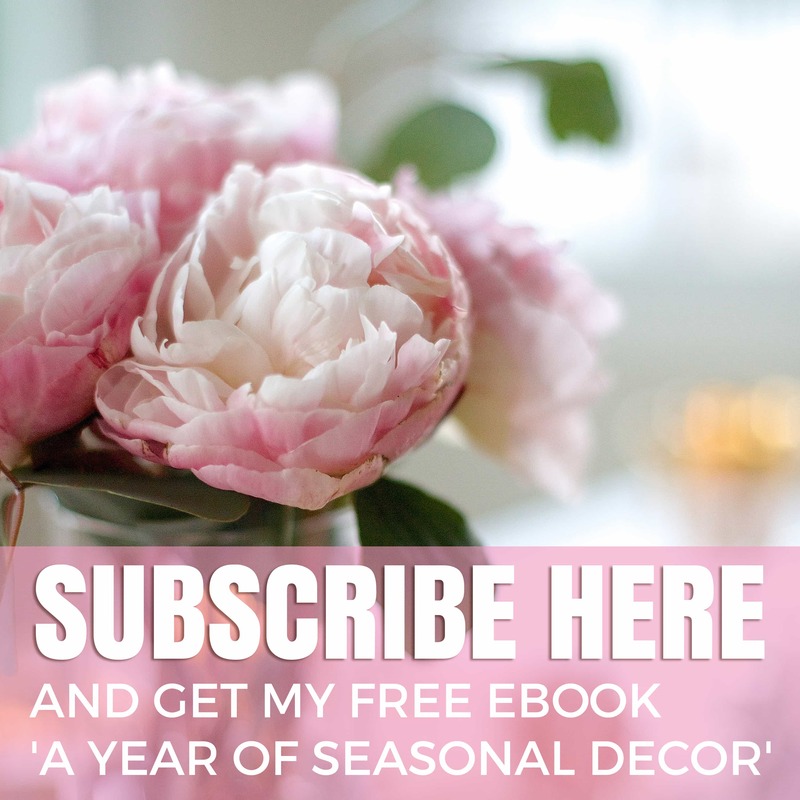 I love your sense of style in your home, and also your imaginative and lovely seasonal tablescapes. I’ve saved them all to copy in my own home. 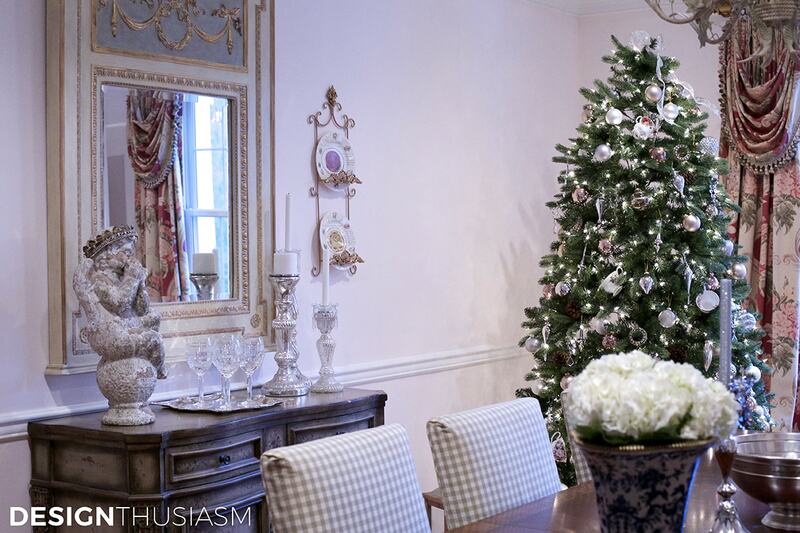 I collect teacups as well, so I love that you integrate them into your everyday decor and now your first X-mas tree. 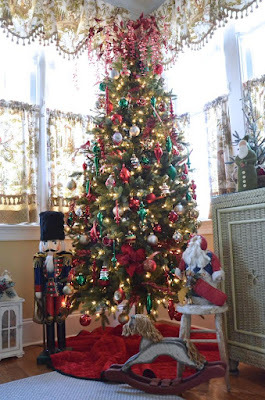 Loved the Christmas Trees,the china cups are great would not have taught of them.Thank you. to purchase the angel on your sideboard? Absolutely love it. Thanks so much, Merry! 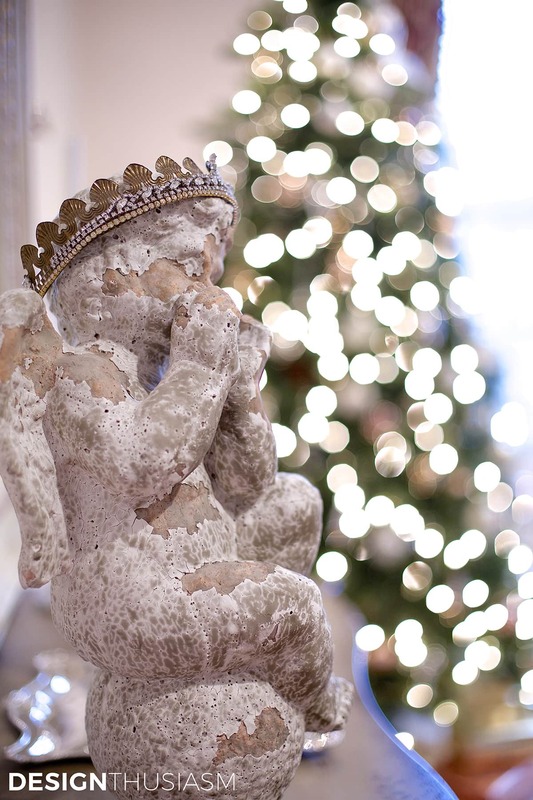 I found the angel at a local garden center, but I’ve been looking for others like it and they’re not that easy to find. If I see any online, I will certainly post the links. Wishing you a very Merry Christmas!! Thank you so very much Barbara, for your lovely comment and wishes!! Thank you for the tea cup idea. This year my mom became an amputee and became a resident of full time nursing care. I brought her vintage tea cup and demitasse cup collection home with me. She lived all around the world during her young mothering years and collected as she went, especially in Europe. She continued to collect with a critical eye until just last year at 88 years old and you have given me great inspiration. I will use your idea to honor her and her passion this year.